When I was a child I used to go with my beloved Grandmother Olive to visit my Great Grandmother Minnie. Minnie lived with one of her daughters who ran a children´s home and had her own little cottage in the grounds. There was space for them to grow vegetables and keep chickens and as a child born and brought up in London, I was fascinated by this little piece of country living. I was allowed to go to the chicken shed and collect eggs and I remember always taking great pride and pleasure in this. The smell, the warm eggs under a broody hen, the clucking – it fascinated me and I always dreamed of owning a few chickens. When Big Man and I moved to our home, we also ended up with a small olive grove with about 30 trees. We talked about one day getting a few hens so that we could enjoy free range eggs. And then one day, my dream came true. Big Man came home with a hen and five tiny chicks. The chicken empire has grown and grown since then. The chickens have moved from a small lean-to shack at the end of our vegetable patch to what we now call “Chickenopolis” in our olive grove. Chickenopolis is a complex structure, made entirely of recycled bits and bobs we have either found or been given. It has a rather grand chicken house, given to us by some friends, along with six of their hens when they moved and couldn´t take them with them. Attached to this is a sheltered run for when it´s raining and they don´t want to go outside. Having said that, although I´m very fond of all my chickens, they´re not the brightest creatures in the world and will happily stand out in the pouring rain all day as long as there is something on the ground to peck at. Adjoining this, rather like a terraced house in a Victorian street of London, is where the Fat Boys live. The Fat Boys, turn away now if you´re squeamish, are all cockerels and a different breed which grow quickly and are bred for eating. Rather than buy 6 week old chickens which have been pumped up with chemicals and hormones, we buy the chicks and give them a happy (and chemical free) life for about 4 months. They grow fat naturally, and then when their time comes, they are dispatched quickly and as pain free as it´s possible to do and enjoyed in delicious meals. Once the freezer is full, the next batch of Fat Boys starts off again. Our chicken population varies, but we have space for about 20 fat boys at a time as they have to be kept separately from the others. We currently have 10 hens and 2 (very happy) cockerels. We are just about to put a broody hen to sit on some eggs, so hopefully once she settles we´ll have a new clutch of chicks 3 weeks later. Our hens can roam free around the olives and take themselves off to bed when the sun goes down. They´re quite bright in that respect! The olive grove is dog and fox proof, but every now and then you´ll lose one – it´s sad, but a fact of life. One of our neighbours traded us three of his hens a few months ago. We thought they were mature, but realised this week that they were probably younger than we thought as it looks like they have just started to lay eggs. We know they must be those responsible for the Funky Eggs, as all our hens are over a year old and have been laying for some time now. When a hen first starts to lay, it sometimes lays a really tiny egg. Our new hens have clearly not read the manual about what shape they should be either, as we are getting the funkiest conical eggs at the moment too. 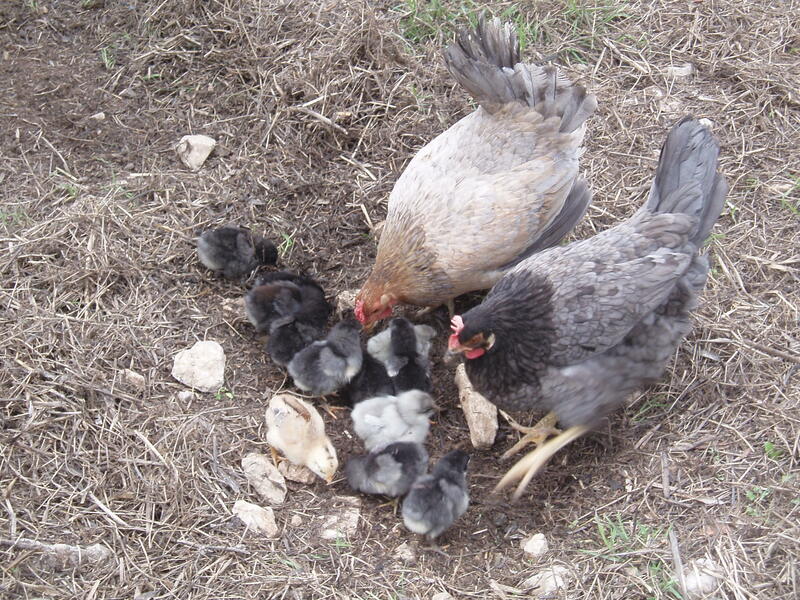 Never mind, we love our chickies, they make us laugh, and in return for what they give us, we hope they enjoy their lives in our little olive grove. This sounds so idyllic to me. I love that photo at the bottom. And fresh eggs and an olive grove, oh my! Yes. We´re lucky. I haven´t got to the stage yet where I take it for granted. I hope I never do. We made our first olive oil this (last) autumn, which was an amazing experience. Cleaning out the chickens is less fun though…..! Hey !!!!!! How are all of your chickens ? they look really good!!! I want some funky eggs ! two of my friends have chickens and so i will tell them about it ! Our chickens are fine! Glad you liked the eggs! Oh what a treasure your chickens are. What do you do with the little eggs? 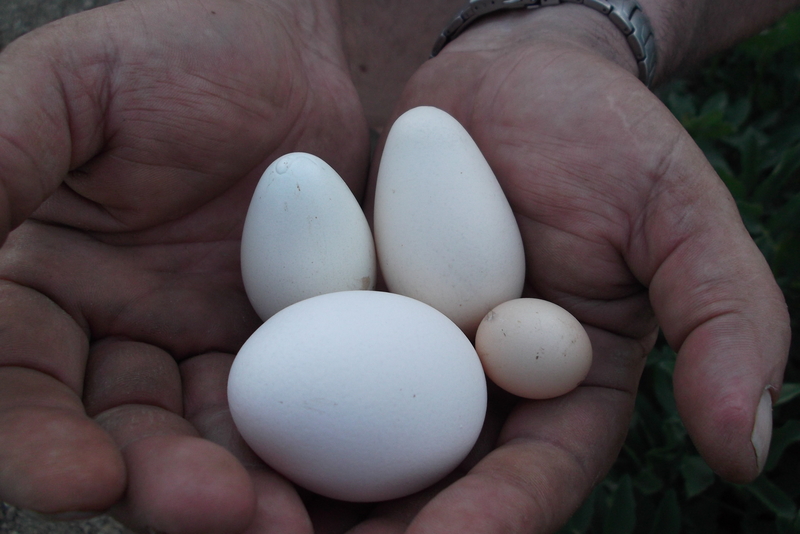 The little eggs are edible – a bit like quail´s eggs, but tend to have tiny yolks at first. We give them to a neighbour´s young child as she thinks they´re specially laid for her! And yes, like you, I don´t think I was made for cold weather. Am so much happier when I can feel the sun warming my bones! Thanks for visiting my blog! After returning the favour and drooling over some of your recipes – I’ll be back! – I couldn’t resist checking up on your chicks. Your ‘Fat Boys for the freezer’ sounds like a well organised system whereas we have more of a mixed bag/ whatever-comes-out-of-the-incubator/from under a hen kind of set-up, but oh….the taste of those free to roam birds, whatever the size! You´re welcome – loved yours too! Hope to see you back here again soon, I´ll certainly be paying you another visit shortly. We have three broody hens currently, so any cockerels born will eventually end up in the freezer, Fat Boys or not!